You gain a damage shield after casting. Spiked Armor: Release your inner dragon to gain Major Resolve and Major Ward, increasing your Physical Resistance and Spell Resistance by 5280 for 17 seconds. While active, the armor returns [1075 / 1087 / 1098 / 1110] Magic Damage to any enemy that uses a direct damage attack against you. Hardened Armor: Duration: 20 seconds. Volatile Armor: Duration: 20 seconds, Area: 10 meters, Target: Area. 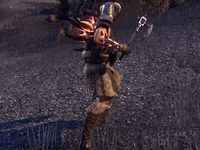 Spiked Armor increases armor and spell resistance, as well as returning some damage to melee attackers. It is well suited to tank builds. You can run into a group of melee enemies and let them kill themselves trying to attack you. The Hardened Armor morph will give you a Damage Shield, absorbing more hits while the armor is in effect, or you can deal extra damage on casting with Volatile Armor. Volatile Armor is a recommended morph for the Dragonknight Initiate build. The damage return for this ability and its morphs has been increased. All ranks of this ability now also grant the buffs Major Resolve and Major Ward. Razor Armor: Renamed this ability to Hardened Armor, which now provides a damage shield equal to 10% of your maximum health. The duration of this shield lasts 3.5 seconds at Rank IV. Volatile Armor: This ability now deals increased damage over 10 seconds. The amount of damage dealt increases with each rank. Fixed an issue where this ability and its morphs would deal their thorns damage when the attacker procced a Disease or Poison Weapon Enchantment on the Dragonknight. Hardened Armor: Increased the damage shield value granted by this morph to 15% of your Maximum Health from 10% of your Maximum Health. Volatile Armor: Increased the damage of the Damage over Time component of this morph by approximately 20%. Reduced the cost of this ability and its morphs by approximately 16%. Developer Comments: We've reduced the cost of the Dragonknight's utility-oriented skills to make their upkeep more in line with other classes. Updated the tooltip for this ability and its morphs to better clarify the types of attacks it will return damage against. Fixed an issue where casting certain self-targeted abilities, such as Spiked Armor, Dark Exchange, or Imbue Weapon, would remove you from Sneak. Hardened Armor: Increased the duration of the damage shield from this morph to 6 seconds from 2.5 seconds.